It is not as famous as the chateaus of Bordeaux, France, for brewing wine, but Ningxia, a remote landlocked area in Northwest China, is stealing the limelight in the winery industry. The Chateau Hedong Chardonnay 2014 and the Chateau Hedong Cabernet Sauvignon 2013, both made in Hedong Chateau, Ningxia Hui autonomous region, won the Gold Medal 2016 at the Concours Mondial de Bruselles, a World Cup of sorts for fine wine, in Belgium. With excellent soil and climate that are perfect for grape production, the Yellow River running through it and abundant sunshine, Ningxia plans to build a world-level winery industry that will be linked to the Belt and Road Initiative, according to Li Huanmei, assistant director of the Ningxia Grape Industry Development Bureau. The fast-growing Ningxia wine region has made impressive achievements in international and domestic contests in recent years, boasting a string of international awards, she said. "Ningxia's wine region is different from other places, because it is internationally well known, besides being popular in the domestic market," she said. The region's Cabernet Sauvignon Luxury Reserve Dry Red Wine 2013 won the 2017 silver medal again at the Concours Mondial de Bruselles, she said. During his tour of Ningxia in July 2016, President Xi Jinping said that Ningxia's winery industry has huge market potential. Ningxia is already exploring comprehensive development of the winery industry. It should continue to do so, he said. Since 2012, when the 18th National Congress of the CPC was held in Beijing, Ningxia has begun to implement an ambitious grape industry development plan in the East Foothills region of Helan Mountain. The plan is to build three wine-making cities, 10 grape-themed tourism townships, more than 100 winery chateaus, 66,667 hectares of grape-growing farmland, thus generating a comprehensive annual output value of at least 100 billion yuan ($15 billion) by 2020, Li said. As the venue of the biennial China-Arab States Expo, Yinchuan, capital city of Ningxia, has become "a new name card" for China's opening-up, as the Belt and Road Initiative is being pushed forward on a comprehensive scale, said Foreign Minister Wang Yi, while addressing an event organized by the Ministry of Foreign Affairs to attract business and investment to Ningxia last year. Ningxia abounds with fertile plains that are perfect for agriculture. According to officials of the Ningxia Hui autonomous region, typical produce includes wolfberry, liquorice, halal beef and lamb. And now, it wants the wine industry to become an economic backbone, the engine for its growth. So far, Ningxia has devoted nearly 44,000 hectares of farmland for grape production, of which 38,000 hectares are wine-brewing grape fields, said Shao Qingsong, general manager of Ningxia Li Lan Winery Co Ltd.
More than 86 winery chateaus have been built in the region, with an annual production capacity of 120 million bottles, or an output value of more than 20 billion yuan. "The winery chateaus contribute a lot to the improvement of local farmers' living standards," he said. "Another 113 chateaus are now under construction." "The winery industry has provided 12,000 jobs for local farmers, with their annual per capita income reaching 3,140 yuan, or 900 million yuan as a whole, making up 28 percent of Ningxia's rural residents' total income last year," Shao said. The Ningxia wine region, the largest of its kind in China, has imported 36 varieties of wine grapes from abroad to improve its winery industry. It has also cooperated with more than 100 internationally recognized winery experts and tasters for production of its top-quality bottled wine. In addition, the Ningxia local government is pushing hard to integrate tourism into every level of its environmentally friendly winery industry. 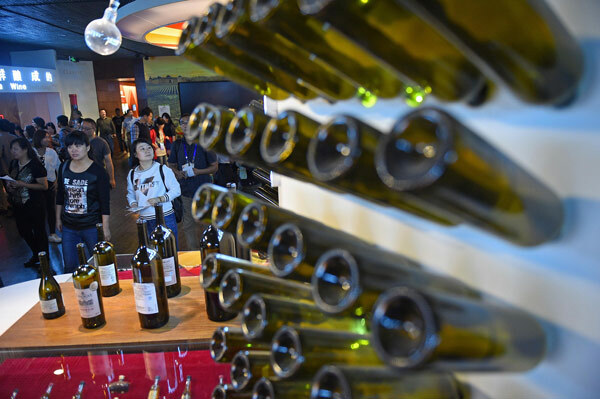 In an area still dominated by the mineral industry, Ningxia's 20 billion yuan winery industry has participated in the annual International Organisation of Vine and Wine, or OIV, Conference over the past five years. It aims to achieve a high global reputation of its winery industry.